[show all]A lost baby mouse is found by Jerry. His name is Nibbles. He's always hungry, and eating anything he can get his teeth into. Jerry takes care of the baby, while he does his best to keep him far away from Tom. But Nibbles' hunger gets the better of him, when he proceeds to drink Tom's milk. 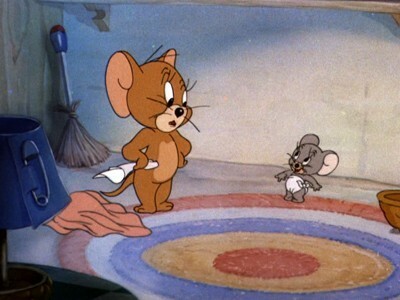 Tom chases Nibbles around the house, as Jerry tries to save him, repeatedly.